In the last few posts, we have seen how to apply additional charges for delivery for different delivery dates, like delivery charges for specific delivery dates, delivery charges for next day delivery & so on. Now in this post, we will discuss how you can apply the tax on delivery charges in Order Delivery Date Pro for WooCommerce plugin. This is useful for those businesses who charge additional cost on delivery for each order, but they also want to include a tax on delivery charges. For example, you have an online flower shop where you charge $25 for delivery and now you want to include 10% of tax on delivery charges. How to setup Tax on Delivery Charges in Admin? 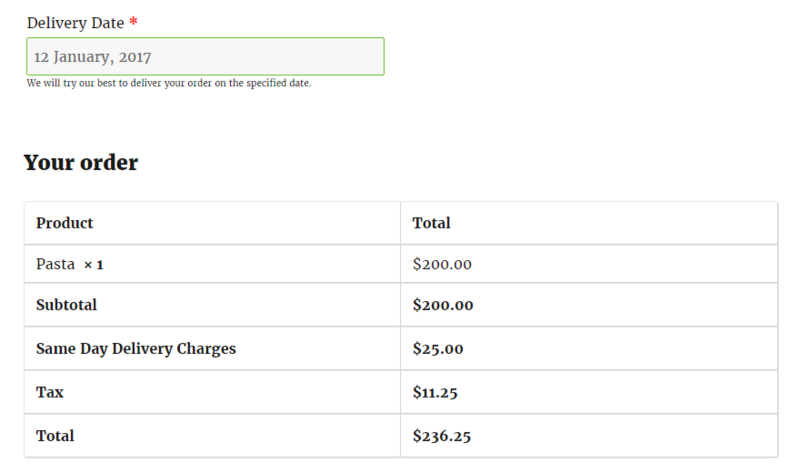 This option is available in the plugin where you can Enable Tax calculation for Delivery charges. You can setup this under Order Delivery Date -> General Settings -> Additional Settings. To add taxes to your product price, you need to select Enable Taxes checkbox in WooCommerce -> Settings -> General. Once the checkbox is selected, you can set your taxes in the Tax tab. If you have an online Italian food restaurant where you have set same day delivery charges as $25 and you had set tax as 5% in WooCommerce -> Settings -> Tax Tab. Once the above settings are done, you need to check Enable Tax calculation for Delivery charges checkbox in additional settings of our plugin’s admin dashboard. Once the checkbox is checked, and the customer will place an order on 12 January 2017 for same day delivery. So Tax on Delivery charges will be included in Your Order table on the Checkout page. You had set tax as 5% on delivery charges and WooCommerce will also charge on purchased product for example if customer purchase pasta of $200 and delivery charges are $25. So 5% tax will be applicable on both, the total tax on pasta will be $10 and tax on delivery charges will be $1.25. So total tax will be $11.25 as shown in below table. If Enable Tax calculation for Delivery charges checkbox is unchecked, then tax will not be applicable on delivery charges, but if Enable Taxes checkbox is checked in WooCommerce, then tax will be applicable only on the product price. In this post, we saw how you can add taxes to delivery charges. The setup will take less than 5 minutes.